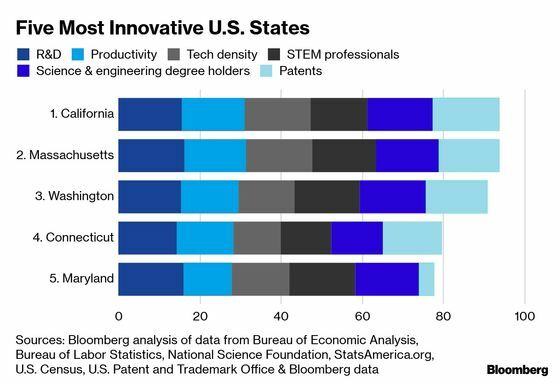 (Bloomberg) -- The Golden State is living up to its nickname, with California ranking as the most innovative economy in America. 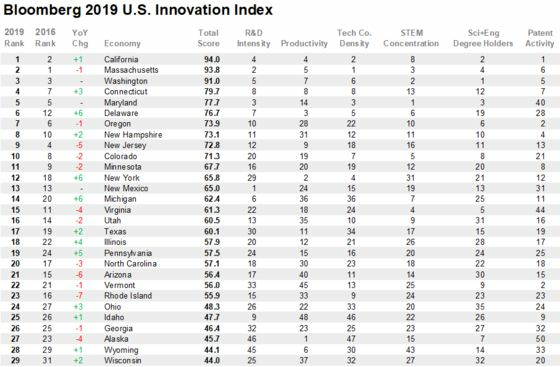 Massachusetts, Washington, Connecticut and Maryland followed California at the top of the innovation scale to round out the top five. California topped the 2019 Bloomberg gauge with a total score of 94 out of 100. 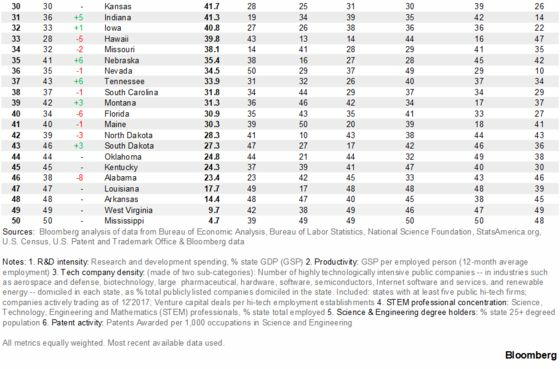 It placed among the top five for all categories except STEM (science, technology, engineering and mathematics) job concentration in part because the state has a large and diverse labor pool. About 15 percent of the S&P 500 companies are headquartered in the Golden State, including Apple Inc., Alphabet Inc. and Facebook Inc., which can tap into the brain power of places such as Stanford University, California Institute of Technology, University of California-Berkeley and UCLA, in addition to attracting educated global job-seekers with lucrative opportunities and compensation. Massachusetts was just behind at 93.8 and ranked highest in the metric measuring both the number of high-tech public companies headquartered there as well as the percentage of tech firms receiving venture-capital funding. The state was No. 1 in the 2016 innovation ranking. “A lot of it is led by the Boston area. It’s not only the large amount of high-quality human capital that is generated out of the area, but it’s that being translated into R&D,” said Joe Lee, a research analyst at Milken Institute. Massachusetts-based companies in the S&P 500 include General Electric Co., Raytheon Co. and Biogen Inc. The state is also the academic home to Harvard University, Wellesley College and Massachusetts Institute of Technology. The state also performed well in R&D, where nearly six percent of its economic capital was allocated. Washington, the home base for Microsoft Corp and Amazon.com Inc., was the only other state to score more than 90. What’s common among the top five states is that they all either have a major tech-centric city or they’re close to one, like Connecticut is to NYC. Besides the well-known hubs on the coasts, MIT economist Simon Johnson argues that there are 102 potential U.S. communities that could be tech hubs if they receive some assistance from the right resource: federal funding. Federal money towards R&D “will be a catalyst to the development of these places and something that would both directly create jobs and create a lot of follow-on private sector investment,” Johnson said. Among the top 10 innovators, six states were on the Atlantic coast and three bordered the Pacific. Colorado was the sole landlocked state in the top tier. The state has high educational attainment and several institutions including the National Oceanic & Atmospheric Administration that perform research and attract technically-skilled workers. Colorado has also focused on promoting commercialization and bolstering the startup and acceleration efforts, said Mark Muro, a senior fellow at Brookings, a think tank in Washington DC. Southern states, for the most part, are at the other extreme. 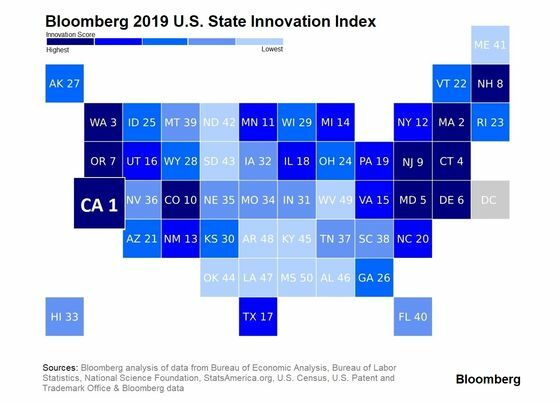 Mississippi was last in the 2019 Bloomberg State Innovation Index, which shows a wide divide between states on the Pacific and Atlantic coasts, and those in the south, particularly near the Gulf of Mexico. The bottom four positions were unchanged from three years earlier, with Mississippi (50), West Virginia (49), Arkansas (48) and Louisiana (47). Combined, those states are headquarters for only five S&P 500 companies, including Walmart Inc., Tyson Foods Inc. and J.B. Hunt Transport Services Inc., none of which are considered tech firms. Among the reasons some southern states lag behind is the inability to funnel the research strengths of academic institutions into nearby businesses, according to Muro. Many southern universities “have very strong basic programs and even technology and science-related programs, but they have fallen down on commercialization,” he said. After universities learn to commercialize, start-ups will emerge in the area and then venture capital funding and the hiring of STEM workers naturally follows. This translates into regional productivity, high value employment and wage premium including for those without college degrees, Muro noted. Delaware, New York and Michigan showed the greatest improvement from the most recent innovation survey with all three moving up six spots. To access the full data set for the Most Innovative U.S. States, click HERE.